Good evening and welcome to Marvelous Mondays Link Party! We hope you had a great weekend and we are so happy that you have come by to party with us again! What recipes and projects did you work on this week? We’d love for you to share them with us! Do you have an older recipe or project that you haven’t shared in a while? Bring it to the party! Can you believe that in two weeks the Marvelous Mondays party will turn one?! I can't believe it's been an entire year since the party began! I also just celebrated my one year blogiversary on June 6th. I sure have learned so much and have come such a long way since I started blogging last year. Let’s take a moment to meet the gal’s who bring this party to you each week. Be paying attention to the blog starting tomorrow! 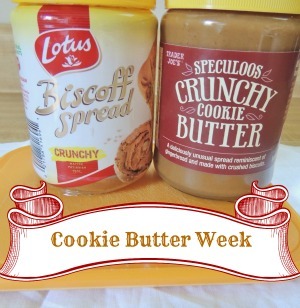 I have declared the week of June 10th as Cookie Butter Week on my blog! There will be lots of new recipes using Cookie Butter or Biscoff spread, plus a couple of fun round-up posts with some of my favorite recipes using cookie butter from some of the best food bloggers on the web. If you love cookie butter, have heard of it and have always wanted to try it, or stumped as to what to do with your cookie butter besides eat it straight out of the jar (not a thing wrong with that, by the way ;) ), then be sure to check back at Frugal Foodie Mama every day next week. You won't want to miss it!